At the moment two of the three Georgetown University riders pictured here are abroad for a semester. From left to right are Katherine Sargent, Lauren Seibel, head coach Jeff Becker and Rebecca Ohman of the Hoyas as seen on opening day October 2016. Seibel was reserve high point rider the day this photo was taken (her IHSA debut) while Ohman went all the way to 2017 Nationals where she placed eighth in individual novice over fences last May 4th. While these two are away for the fall of '17, Sargent came out of the fall 2017 Zone 4, Region 1 season opener sitting in fourth place in the open rider standings. As a team Georgetown scored 26 points on October 7th which puts them only six points out of second place in the early going. 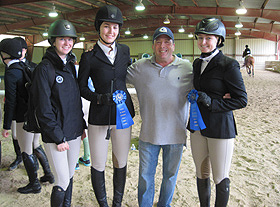 Two Virginia Tech riders advanced through Regionals and Zones to compete at 2017 IHSA Nationals. Karly Clayton (not pictured) was sixth in individual intermediate over fences while Amanda Collins was the reserve national champion in individual walk-trot-canter. 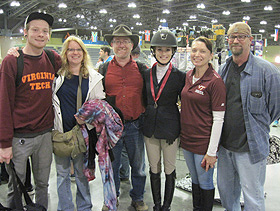 From Roanoke, Virginia, Collins (third on right) is seen here with friends and family who were on hand at AllTech Arena in Lexington, Kentucky to watch her compete in the class made up of 16 riders on May 4th.